Throughout the twentieth century, theatre for young audiences (TYA) was often presented as the manifestation of a series of parallel binaries—audiences versus learners, entertainment versus education, aesthetics versus instrumentalism, fairytales versus ‘issues’. On the one hand, children and young people were invited to enjoy colourful, exciting but familiar stories that aimed to entertain and captivate, presented down at their level; on the other, theatre’s ability to explore multiple meanings and realities was harnessed as a vehicle for pedagogic delivery, raising awareness of pertinent issues and giving children an opportunity to consider other ways of being, often through participation. Discrete practices developed on both sides of the divide, from puppet theatres in Eastern Europe to the Theatre in Education movement in the UK. However, even today it remains rare for TYA practitioners to work within alternative modalities, such as children as co-creators of theatre, or even creative artists in their own right. Theatre by, with and for the young tends to retain or even entrench hierarchical power structures that elevate adults above children: as teachers, leaders or mentors. Theatre for youth third space is Stephani Etheridge Woodson’s formidable riposte to this attitude. ‘Third space’ is the term Etheridge Woodson adopts to describe a model of children and young people as artists, citizens and civic actors. While UK readers may shrink from the faintly Blairite resonances of ‘third space’, it provides a useful break with the established binaries within TYA, a constant reminder of the sheer novelty of democratic processes for young people in the arts. 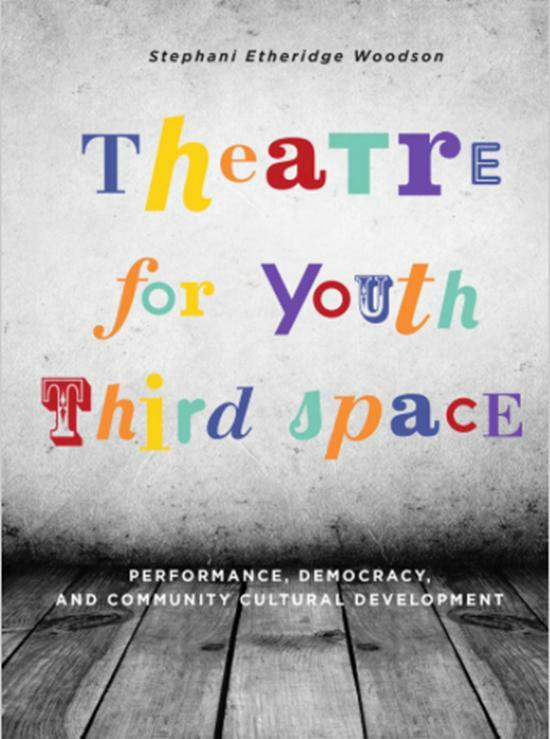 Third space, in this conception, is neither applied theatre nor teaching artistry, but instead a non-hierarchical theatrical collaboration between children and adults seeking mutual transformation. For Etheridge Woodson, ‘ensemble theatre and performance uniquely engage the web of relations and therefore the space of being human’ (p.181). Throughout the text, the author also reminds us that third space is concerned with the community rather than the individual, and seeks societal change rather than individual growth. This shift adds strength to her argument, as she avoids woolly claims of the intrinsic benefits of TYA (for mental health, for example) in favour of a nuanced understanding of the ideological constructs that can complicate our engagement with culture, especially relating to the young. The text is divided into three sections, moving from a philosophical overview to practical applications of Etheridge Woodson’s techniques. The first chapter, ‘Field building, or, the twenty principles of TFY third space’, is a densely allusive tapestry of theory from performance studies, political science, civil rights, applied theatre and economics, among others. The usual touchstones of contemporary humanities research are well-represented—Habermas, de Certeau, Bourdieu, Csikszentmihalyi—but the author also brings in lesser-known authors. Perhaps most fascinatingly, she develops the work of social activist Arlene Goldbard to embed her concept of ‘community cultural development’ within the active, participatory and emancipatory practices of TFY third space. Chapter 2 wrestles with the central issue of the ethics of facilitation: how can an adult leader of a group of children redirect their own status, knowledge, skill and experience to guarantee healthy and democratic working? Hannah Arendt and Raymond Williams provide context to Etheridge Woodson’s discussions of power, hegemony and diversity, but the book’s unique contribution emerges when she begins to outline the specific practices—from icebreaker games to Anne Bogart’s ‘Viewpoints’—that she uses to build community within groups of young people. Recent texts such as The reflexive teaching artist (Dawson and Kelin, 2014) and Theatre and learning (Babayants and Fitzsimmons Frey, 2015) have presented testimonies from socially-engaged artists about the risks inherent within artistic/educational practice, from failing to respond to the group’s specific needs to withdrawing support at the wrong moment, but these confessions are rarely accompanied by concrete proposals for solving such issues. Here, a variety of approaches are presented in detail, as well as shown in combination to form a programme of work. The final section moves further in this direction to provide ‘practical advice on how to plan residencies, approach institutional partners, create trajectories towards true collaboration, and build budgets’ (p.163). At this point, the text takes for granted the reader’s familiarity with the K-12 curriculum in the United States, the vagaries of US arts funding and a commitment to rigorous data collection which may not reflect the realities of working with children outside the USA. For example, several pages are given over to a well-planned template for a project proposal, undoubtedly useful for American artists wishing to apply to federal or state bodies, but bearing only a limited resemblance to Arts Council England, Creative Scotland or Creative Europe models of application. Nonetheless, the plethora of activities, questionnaires and strategies in these pages is remarkable, and at least some of them will be of value to practitioners from many backgrounds. In particular, the section addressing evaluation is concise but invaluable in its synthesis of current research into the analysis and documentation of arts experiences. Rightly, Etheridge Woodson notes that, ‘belief and enthusiasm in our work is not enough’ (p.232); if TYA is to develop into a truly potent tool for community engagement and social change, the adoption of protocols such as these will be key. This volume will be of interest to practitioners, scholars and socially-engaged artists from around the world, especially in its detailed mapping of a theoretical foundation for socially engaged theatre practice with young people that ‘labors to make a difference’ (p.14). The book is not straightforwardly accessible, particularly in the first chapter, but even here repays close reading. For me, Etheridge Woodson’s bold decision to site children as artists with sophisticated creative abilities, rather than proto-creatives or artists-in-training, is a powerful statement in itself, but the book moves beyond preaching to the converted to provide a robust, measured and stimulating description of contemporary practice pushing the boundaries of TYA. Babayants, A. and Fitzsimmons Frey, H. (eds. ), 2015. Theatre and learning. Newcastle upon Tyne: Cambridge Scholars Publishing. Dawson, K. and Kelin, D.A. (eds. ), 2014. The reflexive teaching artist: collected wisdom from the drama/theatre field. Bristol: Intellect.